Let’s begin from the skills. Any serious Blacksmith should spend several skill points into the Blacksmithing skill line. This will help you to progress much faster in this difficult profession. You will be able to receive more resources and make researches faster. The table below displays all skills a Blacksmith can master. 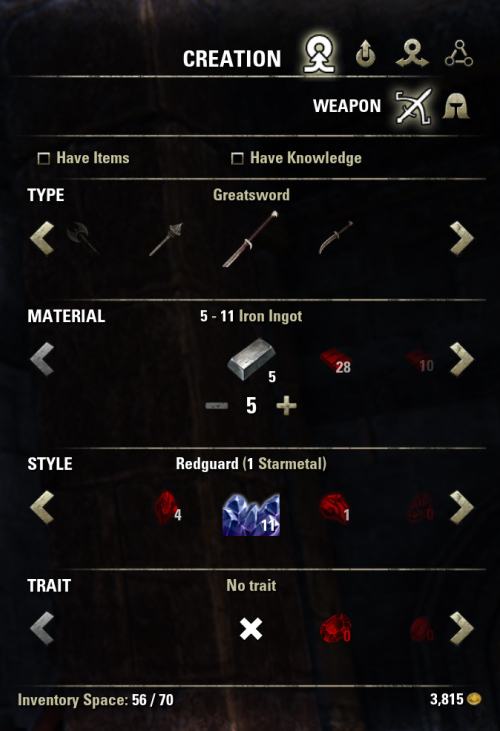 Metalworking (1/9) Allows the use [Ingot type: Iron, Steel, Orichalc, Dwarven, Ebony, Calcinium, Galatite, Quicksilver, Voidstone] for craftimg items. Must have! Keen Eye: Ore (0/3) Ore nodes in the world will be easier to see within 20/30/40 meters. Useful ability for farming nodes. Miner Hireling (0/3) A miner hireling will send you ore and possibly other items every day. When you level this skill hireling will bring you more resources with better quality. Must have! Metal Extraction (0/3) Improves the chance of extracting Blacksmithing ingredients. Also great skill that allows to get more resources from deconstructing and extracting. Metallurgy (0/3) Reduces research time by 5%/10%/20% and allows the research of two/two/three traits at once. Great skill for fast researching. Temper Expertise (0/3) Increases the chance of improving items with tempers. Must have! The last tab of crafting menu is called “Research” and allows you to research traits of a particular item. What for? You can use this knowledge later, when you craft new items. You can add different traits to your items making items much stronger and beneficial. If you want to research new trait you must have an item with this trait in your inventory. For example extra critical strike chance. You can make a research and learn the effect in order to be able to apply this new effect to your own items while crafting. Each weapon type requires individual researching. I mean if you have researched how to add critical strike chance to your dagger you will not be able to use this effect for a sword. You need to perform an individual research for each weapon type. Each weapon type will require 64 days for learning all the traits. How to research faster? There is one thing that will help you to finish all the researches much faster. There is a great skill called Metallurgy – if you spend 3 skill points and boost it to maximum rank you will be able to research 3 traits at once and the research time will decrease by 20%! If you are going to become serious Blacksmith you must master this skill! Don’t forget that after you have finished all your researches you can always redistribute skill points :) The respec feture is available and you can read about how to respect here: How to reset skills and attributes in ESO? Just a heads up. There are some errors with your information. Firstly it does not take 10 ore to make a single ingot. In fact you need to have a stack of 10 ore to smelt but you receive 10 ingots for it. In addition, the research time doubles for each trait you are learning on a particular item type. 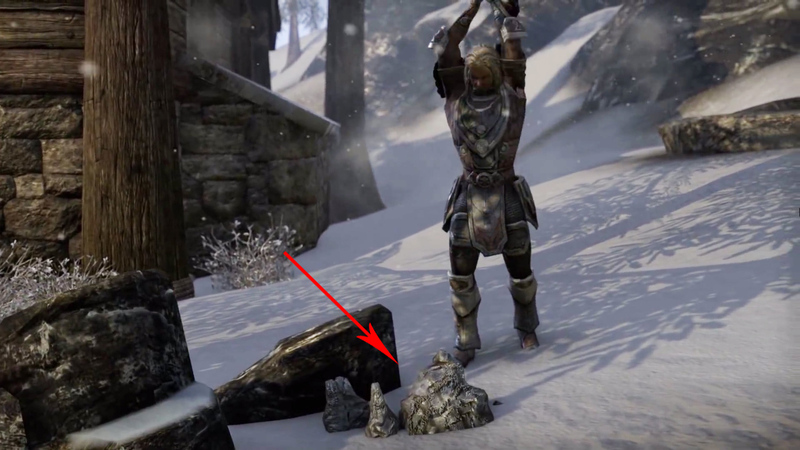 For example, one handed sword's first trait will take 6 hours, the next 12, the next 24 and so forth. Thanks for your corrections. I missed this in the guide. Further information I found is that when you use the stack of 10 ore to produce ingots you regularly get only 8 or 9 ingots instead of 10 and occasionally get trait stones in addition to the ingots. For example On one such conversion from ore to ingots I only received 8 iron ingots but also a diamond. To follow on from Joshua- Research is fascinating but time consuming. An important point to make is that the item is consumed in research. You have to break it apart to extract the magic — or the knowledge to be able to apply the Trait to another item. BYE blue sword you wanted to use. As Joshua mentions the time for each research of a piece doubles. In plate hand items for example there are 8 different traits. That means to research them all would take 63 days back to back. As there are 7 total slots to research — hands, chest, feet, legs, head, waist and shoulders… it could possibly take 1.2 years (7*63days) to research them one after another. That doesnt include the weapons in blacksmithing… only armour. LOL. Thankfully there are some traits that are better with armour than others so you can be selective and reduce that 63 per slot type to 8 days for useful traits. Then add in a skill (metallurgy) you can get in blacksmithing that reduces the research time by 5% and adds a second item that can be researched at the same time this makes research much more managable when you begin to specialise in it. Each skill start with you to be able research an item in it. Blacksmithing can research one- woodworking can research one in parallel. This also means you can have 2 items going at the same time when for each skill — too. :) At blacksmithing skill level 18 you can put another point into metallurgy and improve the time and number of items further. Enjoy skilling. None the less very good beginner guide, I didn't have that much time to study all these in the beta sessions I played, but I will definitely make use of the info when I get to play the real game.